The Electrocardiogram Electrodes are the devices which connect the patient to the electrocardiograph. The electrical data of the heart is obtained through them for the tracing and printing of the Electrocardiogram. For a standard Electrocardiogram 10 electrodes are used, divided in two groups: Limb Electrodes and Precordial Electrodes. The 12 Electrocardiogram leads are obtained from all data provided by them. When an Electrocardiogram is taken is essential to know the exact placement of the electrodes on the patient. Electrode misplacement could mean from small variations in QRS morphology to critical diagnostic errors. 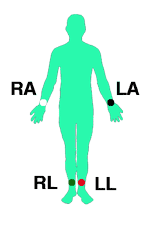 The four Limb Electrodes are located on the patient’s limbs. They are usually distinguishable by colour (Read Tips for placing EKG Electrodes). In the case of an amputee patient, the corresponding electrode will be placed on the residual limb, or failing this, on the nearest region of the torso (shoulders or lower abdominal region). The six precordial electrodes are located on the precordial region. V1: In the fourth intercostal space, just to the right of the sternum. V2: In the fourth intercostal space, just to the left of the sternum. V3: On a line midway between electrodes V2 and V4. 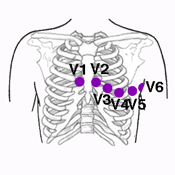 V4: In the fifth intercostal space, in the mid-clavicular line. V5: At the same level as electrode V4, in the left anterior axillary line. V6: At the same level as electrodes V4 and V5, in the left midaxillary line. In article Tips for placing Electrocardiogram Electrodes we show you how to avoid frequent mistakes. In certain patients, in case of suspicion of Posterior or Right Ventricle Infarction, it is advisable to place the electrodes in positions other than described to obtain the Posterior and Right-sided leads. Remember: Electrodes should not be confused with leads. Electrodes refer to the devices we place on the patient and leads refer to the tracing of the electrical activity on the Electrocardiogram. In the next section we will further explain Electrocardiogram Leads. Click on Next down below to stay with us. How to perform an Electrocardiogram might also be of interest.